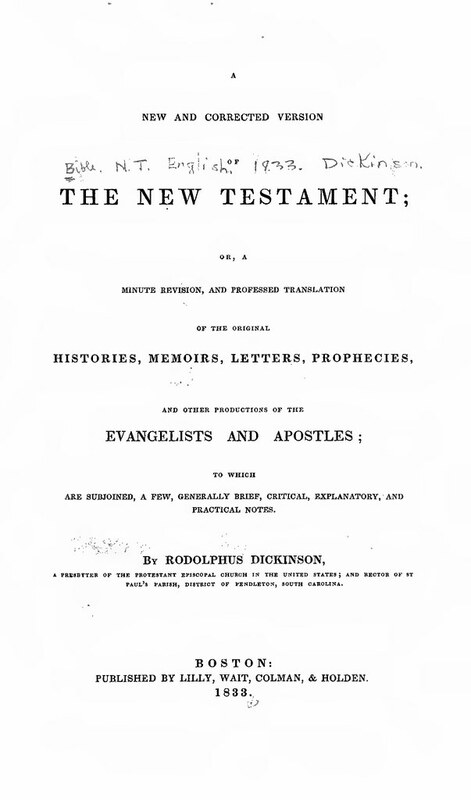 Click here for sample verses from the translation by Rodolphus Dickinson. Title: A New and Corrected Version of the New Testament; or, a minute revision, and professed translation of the original histories, memoirs, letters, prophecies, and other productions of the Evangelists and Apostles: to which are subjoined a few, generally brief, critical, explanatory and practical notes. By Rodolphus Dickinson. Publisher: Boston: Lilly, Wait, Colman and Holden, 1833. References: Chamberlin 548-1; Hills 839; Herbert 1797, Taliaferro-EELBV 7325.